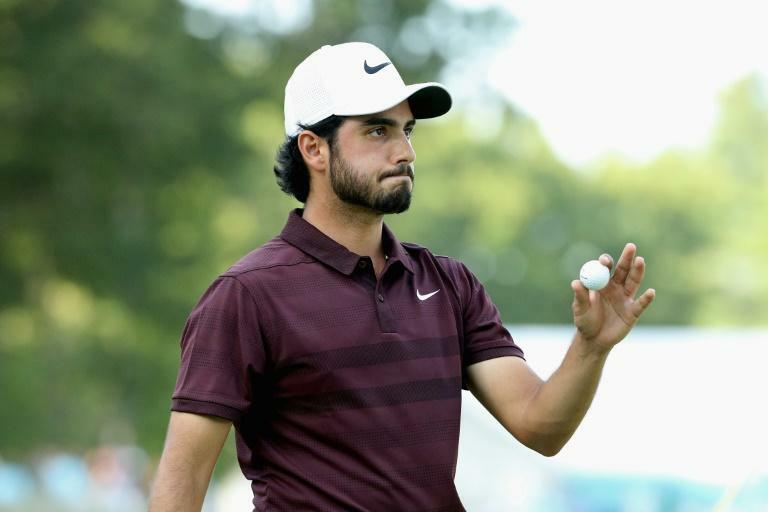 Abraham Ancer, trying to become the first Mexican player in 40 years to win a US PGA title, took a one-shot lead into Monday's final round of the Dell Technologies Championship. Ancer opened with three birdies on his way to a six-under par 65 on Sunday at the TPC Boston course to stand on 13-under 200 for 54 holes, one stroke ahead of England's Tyrrell Hatton and American Bryson DeChambeau. It was Ancer's lowest round since a third-round 65 on his way to a share of fifth place at July's Canadian Open, among four top-10 showings in 28 starts this year for the 27-year-old who holds dual US and Mexican citizenship. "It has been a fun week. I hit the ball real good today, especially," Ancer said. "I got the putter rolling on the front nine. Not so much on the back nine, but still hit the ball really well. So I'm very happy." Ancer -- born in McAllen, Texas, and raised in Reynosa, Mexico -- would become the first Mexican winner of a PGA event since Victor Regalado captured the 1978 Quad Cities Open. "Having two PGA tournaments now in Mexico has impacted Mexico or golf in Mexico incredibly," Ancer said, citing the WGC Mexico Championship and the OHL Classic at Mayakoba. "A lot of people know about it now, because not a lot of people really pay attention to golf in Mexico or I guess the mass. And trying to get more affordable for having public golf courses would be awesome. "If I win soon or whenever that happens, if it happens, it will be awesome for Mexico. I think it will even push it a little bit more and make it just a well-known sport over there." Tiger Woods, a 14-time major champion in his comeback campaign after spinal fusion surgery, fired a 68 to share 16th on 206. Woods played alongside DeChambeau, who fired the day's low round at 63 to share second with Hatton, who shot 69. DeChambeau, expected to join Woods in getting a US Ryder Cup captain's pick from Jim Furyk on Tuesday, answered a bogey at 15 with birdies 16 and 17 and landed a 237-yard second shot two feet from the cup at the par-5 18th for a tap-in eagle. "It's never bad to shoot 4-under your last three holes," DeChambeau said. "I was little frustrated about 15 in taking bogey as I hit a really good putt, a fraction too hard, made a 360-degree lip on me. That's golf. It's going to happen. "But I was able to respond well. I think that's the important thing." DeChambeau is looking to win back-to-back following his tearaway four-shot success a week ago in New Jersey in the first of the season-ending US PGA playoff events. Multiple-major winners Rory McIlroy and Jordan Spieth were on 204 as 11 rivals to Ancer lurked within four shots of the lead. McIlroy, who fired a 66, showed his disgust in under-arming his putter at his golf bag after missing a par putt on 18 while Spieth, seeking his first victory this season, fought back from bogeys at 13 and 14 to birdie 15 and 16 on his way to shooting 68. "I've gotten more comfortable with the feels, absolutely, through the bag," Spieth said.